It was great to see the Indy Racing League return to the tradition of racing at THE Milwaukee Mile immediately after the Indianapolis 500. Unfortunately, by the looks of the empty seats it would appear the good folks of Wisconsin may have thought the race was still in July. I know they weren’t drawing big crowds before they pulled out of racing here in Phoenix, but my goodness they weren’t THAT small – were they? "I'm not in it to be famous. I got the winners check, I got the trophy and I got 50 points in the bank for the championship. I'm not worried about being on the front of the USA Today. If I want to do that, some day I'll just get out of the car and beat the hell out of somebody." Nothing beats Dan and Danica getting all bent out of shape over each other. This may not be the sophomoric catfight that was artificially designed involving Danica! And The Fisher Queen (although I’m sure they aren’t exactly best buds), but having a man and a woman as rivals in any sport is almost unheard of. I mean, this is the kind of tension fans have been hoping for since Bobby Riggs erroneously called out Billy Jean King. I LOVE IT! Take a look at the picture of Nariz after his second straight win at Milwaukee. This man must be totally bent out of shape that he didn’t win at Indy, and he’s now he’s focused/driven/hungry/possessed to reclaim the points championship. Winning the biggest race of the year by a rain delay may at first cast some illegitimacy on Mr Judd’s accomplishment, but it’s very clear he’s going to be running near the front at just about every track this year. He’s now in the championship points leader. They didn’t win, but TCGR finally figured out a short track setup. After abysmal results here in the past few years, I’m sure they’ll take the 3rd and 4th for Wheldon and Dixon and head happily to Texas Motor Speedway this week. The Mirror Man finished in 5th, largely due to some stupendous pit stops by his Panther Racing crew. 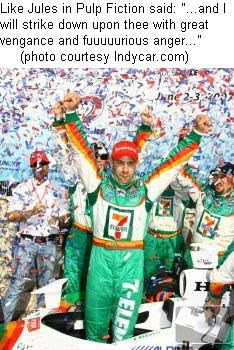 Looks like he may be repeating last year, when after Indianapolis he went a on ferocious tear by finishing in the Top 6 in all but one of the last nine races. Sunday should have been a good day for Dreyer and Reinbold, as Buddy Rice decided to gamble by staying out and leading the field for 37 laps early in the race. Instead, the yellow he needed to stay on top never came, he got hung out and lost a lot position before getting to the pits and dropping back a lap, and then he got too high on Lap 156 and wrecked. Result: from leading the race to finishing Dead Freaking Last. I don’t want to rub the noses of all those giddy reporters at the beginning of the year in the pile of crap that is Marco Andretti’s season, because I really feel badly for him. With his surname the league needs him to be a successful draw and a marquee driver, but he’s still the youngest driver out there and he’s still competing against a field where most drivers have arouond 50+ starts in the ICS. The Wrecker broke his streak of “running” finishes dating back to Nashville of last year after a driveshaft failure. He was running well up until that point, and it appeared he was one of the few drivers who dared to drive consistently on the high side of the track. He heads to Texas, site of his last victory way back in ’05. OK, I’m going to say what people are thinking: having two rear wings go down on a team like Penske’s looks really, really, REALLY suspicious. This one of the teams that’s considered to be on the leading (don’t say “bleeding”) edge of racing technology, complete with their blankets over mirrors, sidepods, and whatever else they feel like covering up. In this era of hollowed-out bolts and wickers, the first thought that occurs is that Penske Racing tried something to help speed up their cars and it backfired. Now I’m not saying I know they cheated, but it would be reassuring if Brian Barnhart and his band of merry men can check out the cars and discuss their findings at a press conference. Also, I didn’t expect the announcers to exactly call out prominent league owner like Roger Penske, but the team was saying little more than how “odd” it was. Odd doesn’t begin to explain it, because after we got to hear D&R called out for cheating last month it wouldn’t be so “odd” to presume other teams were bending the rules. Marty or Scott can ahead and call it “suspicious” or “questionable” or even “fishy” given that Uncle Sam and Spiderman BOTH had these problems. In the meantime, let’s hope the Iron Hand of Justice checks out those attenuator and rear-wing assemblies. We can’t have any of those collapsing in the 220MPH racing in Texas this week. The parts that failed on both the 3 and the 6 are parts that are not standard Dallara parts. There are certain parts on our cars that teams are allowed to develop and build on their own. The parts that failed in this particular case are parts that are open for development by the teams, developed by their own team and made by their own team. Those are the ones that failed. So, that would not be cheating, although my tin hat says it’s still fishy that we don’t know what the “certain parts” are.